A viral photo of a man squatting to change his son's diaper has inspired a movement. JACKSONVILLE, Fla. -- An Instagram photo showing a father squatting in a men's restroom to change his baby's diaper brought a serious conversation back to the forefront - the lack of changing tables available in men's restrooms. Donte Palmer said one of his other children snapped the photo of him on the floor in the restroom of a restaurant in Jacksonville, Florida. The photo went viral, with people from coast to coast, including celebrities, showing Palmer support. "The support is phenomenal. I mean, dads are like -- it's like when dads come together, it's like a big teddy bear you get on Valentine's Day," Palmer said. "It's like, all love, you know?" He said the broader issue is about fathers being treated as equals to mothers and sharing the responsibilities when it comes to parenting. "Fathers, we aren't highlighted like we should be," Palmer told WJXT. "And I just want to bring that view and that light to us fathers, because we do matter and we do exist, and we are willing to do more than just provide and protect." He and other fathers like him are starting a movement called Squat For Change. They're hoping it brings attention to what he says is a big need for changing tables in men's restrooms. Palmer adds this is a worthwhile cause that deserves the spotlight it's getting again. Back in June, a father of four in New Hampshire went on a rant about the issue and posted it on social media. In that case, Chris Mau was out with his 8-month-old daughter who needed a diaper change. When he went to the men's room, he discovered there was no changing table. "I can't justify leaving my daughter in a messy diaper to try and locate a proper changing table, so I threw down the emergency towel, as I call it, which I always keep in the stroller," Mau said at the time. Actor Ashton Kutcher has also been very vocal about the matter over the last few years. In 2015, he started a Change.org petition to rally for changing tables in men's bathrooms in retail stores. Palmer said this movement isn't just for dads, though. He said he encourages moms to get involved and push for positive change, too. "Regardless of race, regardless of size, or regardless of financial status, you know, we are fathers at the end of the day and we will do anything to protect and to nurture our babies," Palmer said. 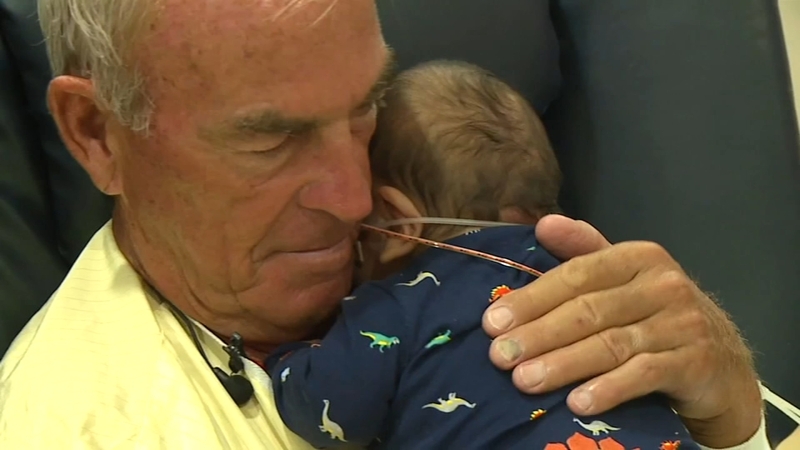 An Indianapolis grandfather is using his free time after retirement to rock sick babies to health.